Damn you! Damn you, Aaron Sorkin! How dare you make me love a show and then take it away! And a serious drama at that! I don't watch serious dramas! But when The Newsroom: The Complete First Season came across my desk (I don't really have a desk, but you get my point.) to review, I checked it out and I was floored by the creativity, the characters, and the sense of humor. Following that, I plowed through Season Two, and I was just as floored. So, imagine my devastation when I learned that the third season was not only going to be the last one, but that it was going to be an abbreviated six episodes. Sorkin! Well, I guess that I should appreciate what I've got and see if the show ends on a high note. Season Three of The Newsroom opens with ACN news anchor Will McAvoy (Jeff Daniels) and his producer, MacKenzie McHale (Emily Mortimer), discussing their upcoming nuptials (and disagreeing on most points), when they get word on the bombing at the Boston Marathon. While the newsteam, including Jim Harper (John Gallagher, Jr.) and Maggie Jordan (Alison Pill), scrambles to decide how to pursue the story (as they don't want to get burned, as they did in Season Two), ACN website editor Neal Sampat (Dev Patel) gets a message with encrypted government files. Will gives Neal the go-ahead to get a new computer in order to transfer the data. However, the feds learn about this and raid the office, sending Neal on the run. Meanwhile, a rumor surfaces that ACN is going to be sold. Will it be taken over by the niece and nephew of Leona Lansing (Jane Fonda) or will another party get involved? And how will the team do the news with all of this going on? The third season of The Newsroom continues the qualities which made the first two seasons so good, even if it is crammed into six episodes. One of the conceits which makes the show great is how it takes important and Earth-shaking news stories from the recent past and builds stories around them. As noted, this season kicks off with the Boston Marathon bombings. This does not become the focus of the show, but it demonstrates how these familiar incidents draw us into the show. Later on, the pursuit of Edward Snowden pops up, and serves as a way to both move the story along, but act as a life-line to our world. The series continues to allow the characters to grow. The Newsroom has an interesting way of allowing office romance to be a part of the show without allowing it to become too soapy. If you can say one thing about Sorkin, it's that he writes shows about adults for adults. The couples here show affection towards one another and pine for one another, but they also focus on doing their jobs and understand that love has its time and place. Perhaps because he wants to go out on a high-note, Sorkin allows the couples which we like fall into place. There is a character death in the end, and it's incredibly touching. The largest amount of growth occurs for Will. I won't give too much away, but by standing up for the freedom of the press, Will gets into hot water, and this allows for a very creative exploration of his upbringing. I seem to remember reading somewhere that Sorkin was resistant to doing a third season (although I could be wrong about that), but he certainly doesn't phone it in. While the season may be truncated, it is incredibly satisfying and it Sorkin was in anyway hesitant, there is certainly no bitterness here, as the show allows all of the various pieces to fall into place quite nicely. Which brings me to my final point -- It only left me wanting more. The Newsroom was one of the most intelligent and clever shows ever, as it did a fantastic job of jabbing at politics and the media while also serving up stories and character arcs which were actually intriguing. Even moreso, the show presented us with characters who were at the top at their game and wanted to do the best job that they could. I found this to be incredibly inspiring and The Newsroom made me take a look at myself and my drive in life. How many contemporary television shows have that kind of power? Yes, The Newsroom will certainly be missed, but I'm glad that I watched it and I'm sure that I will be re-watching the entire series in the near future. 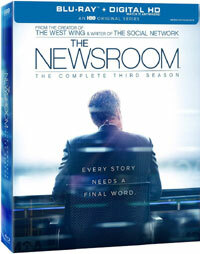 The Newsroom: The Complete Third Season could have dropped the musical number on Blu-ray Disc courtesy of HBO Home Video. The 2-Disc set contains all six episodes of the show's third season. The show has been letterboxed at 1.78:1 and the Disc contains an AVC 1080p HD transfer which runs at an average of 30 Mbps. The image is very sharp and clear, showing on overt grain and no defects from the source materials. The colors look very good, and the image is never overly dark or bright. The level of detail is excellent and the depth looks nice. Overall, this transfer rivals HD cable broadcast quality. The Disc carries a DTS-HD Master Audio 5.1 track which runs at 48 kHz and an average of 4.0 Mbps. The track provides clear dialogue and sound effects. Being a drama, we don't get a lot of dynamic sound effects here. The activity in the newsroom does supply some notable stereo and surround effects, which can make us feel that we are in the center of things. The Newsroom: The Complete Third Season Blu-ray Disc set contains only a small amount of extras. We get an "Inside the Episode" for each episode. These brief (2-3 minutes) segments offer comments from the team behind the show who give a short synopsis of the episode's story and themes. The only other extra is an AUDIO COMMENTARY for the episode "What Kind of Day Has It Has Been" from Creator/Executive Producer/Writer Aaron Sorkin and Executive Producer/Director Alan Poul.